Trey Foster, Duncan Aviation Marketing Intern, is a recent University of Nebraska at Lincoln graduate with a degree in Marketing & minor in Psychology. While at Duncan Aviation, his assignment is to shadow team members across the company and share what he has learned. This experience has allowed him to see what they see, watch them work in tandem with other employees and realize how these connections help the company operate and succeed in the unparalleled fashion Duncan Aviation does. Trey is pursuing a career in coaching at the collegiate level. Fun Trey Fact: He watches cartoons everyday. His current favorite is An American Tail: Fievel Goes West. Many people say not to judge a book by its cover, but we at Duncan Aviation believe the quality of a workspace is often a direct correlation to the quality a business provides. Quality and pride in all areas of employment are visibly represented throughout the facilities of Duncan Aviation. Because of the varying hours our team members work to provide nose-to-tail business aircraft services on a tight timeline, communication with one another is one of the most important keys to a successful process. The number of people involved in each tailored aircraft project raises exponentially the longer those aircraft stay at Duncan Aviation. With this in mind, we strive to make sure every specialist who works around the aircraft is well-suited for their particular role in the process. 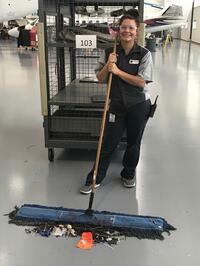 To help us gain perspective on her role in the Facilities department, Atley Cerveny allowed us to follow her and get a chance to see everything her job entails—at least for that day. Our specialists in the Facilities department every day work with a wide variety of team members with very different roles in the aircraft maintenance, refurbishment, upgrade and paint projects. These day-to-day coordinations range from working with the Scheduling team, who figures out when and where planes are going to reside, to helping the Line Department move aircraft in and out of the hangars, to assuring the highest in safety with the quality control department. With such wide array of roles to play, our team in facilities choreographs a working environment that is clean, orderly, safe and efficient.